Overwhelmed. Nervous. Exhausted. Agitated. Pained. All at once. Yep, if you’re like, well, pretty much every worker ever, you know what we’re talking about: stress. No matter your job, work stress is like the zero on a roulette wheel: it’s coming around eventually. *Note: scientific backing for this may be minimal. Yes, you’ve heard these all before. Too bad. Scientific study after scientific study has validated the effectiveness of all these things for relieving stress. Sleeping, eating right, and exercising are all great for your physical health, but more importantly, they also do wonders for psychological health. All three help boost endorphins, regulate dopamine, and simply keep you happier. Doesn’t mean you can’t cheat. (Because sometimes the best stress relief is binge-watching Game of Thrones with a pint of chocolate chip cookie dough ice cream.) But if you want to manage the stress you already have while simultaneously helping bullet-proof yourself from stress in the future, you owe it to yourself to start thinking about all these things. Often the source of work stress is the feeling that work can never end. That feeling’s certainly grown as electronic communication ensures you can always be found. Or does it? Sometimes the best stress-prevention technique is to work on saying no. No emails after 9pm. No work on the weekends. No letting managers add more work to your already-too-full plate. You don’t have to choose all of these, but you should choose the one or two that matter to you. Studies prove it: interruptions make us more agitated. That’s why one good strategy is to keep interruptions to a minimum. Turn off your internet connection for a while. Or at least close your email reader and chat windows. Put a “do not disturb” sign on your door or cubicle. Wear big headphones so that people know not to bother you. You’ll get more done and won’t feel pulled in a million directions. Not having to worry about remembering what you have to do frees up a surprising amount of emotional energy to actually do those things. If it feels like you’ll just never get everything done, sometimes you just need to realize that you don’t have to. Make a list of all the tasks on your plate, then decide what really has to get done, and what you’d just like to have done. This doesn’t mean that what you’d like to get done isn’t important. But you can worry about that later. Again, studies show that a cluttered desk helps raise work stress levels. Often when everything else feels unruly, taking 30 minutes to organize your workspace can bring a relieving feeling of calm. Note: this same strategy applies to your apartment, your house, your car, your briefcase, or any other place you keep your stuff. If you get stressed because you’re always running behind schedule, what can do the trick is coming to work 10 minutes early every day. Get some coffee, put your stuff away, and plan out your day. By the time “worktime” hits, you’re already rolling! William Congreve wrote that “Musick has Charms to sooth a savage Breast.” He’s right. If you need a little de-stressing at work, throw on the headphones and dial up whatever tunes make you happy. Beyonce? Bach? 2-Pac? Doesn’t really matter — if you’re digging it, you’re feeling better. It’s tempting to feel like the only way to manage a stressful workload is to power through it, non-stop. Turns out that’s actually counter-productive. It’s a fact: breaks let you get more done. If you’re worried about all the work you have to do, set breaks for yourself. Work hard for 25 minutes, then walk around for 10. Work hard for another 25 minutes, then read something stupid online. Give yourself time to recharge; it’ll keep you from burning yourself out. And when it is time to take a vacation, be sure to schedule time off and enjoy some much-needed R&R. This is falls more into “larger strategies” than “things to do right now.” That said, at plenty of workplaces, meetings pile on until there’s no time to simply sit down and work. That’s stressful. No matter where you are on the totem pole, you’ll be helping everyone else on your team if you advocate for dropping unnecessary meetings. There’ll be fewer things to worry about, and you’ll free up more time for everybody. Sometimes the best cure for stress is to simply be nice to yourself. And what better reason is there to be nice to yourself than for having done some good work?Along with breaks (see #9 above), small rewards can be a great way to keep yourself productive, while helping you tally the amount of work you’ve actually gotten done. So work hard for a while, then reward yourself by writing to a friend. Or having a small treat. Or leaving the office for 10 minutes. By holding those rewards back until you’ve earned them, you’ll be more motivated to work. But by giving them to yourself, you’ll tell yourself you deserve them. Silly as it might sound, cultivating a thankful attitude can reduce both general and work stress, and make you happier. As a general life practice, working to be more thankful is one of the best ways to keep you stress-free (or at least stress-reduced). There are lots of ways to do this. Keep a gratitude journal. Force yourself to say “thank you” to three people a day. Spend 5 minutes every night going over what you’re thankful for. Whichever of these you choose, keep doing it. In a short period of time, you’ll notice how much better you feel. 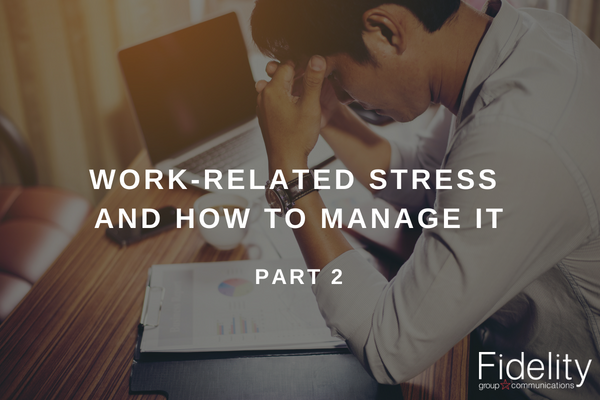 If you’d like to learn more about how to manage workplace stress, why not check out our Stress Awareness, Management and Well-being course on the Fidelity eLearning platform. It’s only £40 including VAT!